…A residue of disappointment clings to go to these pages: Ellington was an elegant man but not a very nice one, Teachout concludes, exploiting the musicians he gathered and held so close. He used his musicians (not to mention his women) often quite coldly, and his romantic-seeming life was really one long cloud of shimmering misdirection. Teachout reveals that Ellington was rarely the sole composer of the music associated with his name. Nearly all of his hit songs, Teachout explains,"were collaborations with band members who did not always receive credit—or royalties—when the songs were recorded and published." It's long been known by fans that many of the most famous "Ellington" numbers are really the arranger Billy Strayhorn's, including "Take the A Train" and "Chelsea Bridge," and that the valve trombonist Juan Tizol wrote most of "Caravan." But most of "Mood Indigo" was Barney Bigard's, while "Never Know Lament" (which became the hit "Don't Get Around Much Anymore"),"I'm Beginning to See the Light," and" I Let a Song Go Out of My Heart" began as Johnny Hodges riffs and then became songs. "Sophisticated Lady," "Prelude to a Kiss," and "In a Sentimental Mood," in turn, are melodies originally blown by, and rarely credited to, the alto-sax player Otto Hardwick. None of these are obvious, all-purpose riffs, or simple blues phrases. They're rich, melodic ideas, as complex as anything in Gershwin or Rodgers. 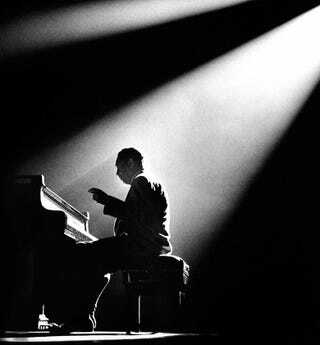 Ellington owned them, but they didn't start in his head, or take form under his fingers. Teachout says all the right things about how, without Ellington's ear to hear them and his intelligence to fix and resolve them, these might have been butterflies that lived a day, fluttered, and died. But you sense that he's shaken by the news. It seems like theft. It certainly bothered the musicians. Hodges used to make a sign of counting money when Ellington was playing the medley of his tunes. One might be a touch more defiant on behalf of the Duke. Ellington really did take other men's ideas and act as if they were his own. But he did this because because he took other men's ideas and made them his own. There are artists whose genius lies in exploiting other people's talent, and we can recognize the exploitation as the genius. It is the gift of such artists to be able to energize and paralyze other people and do both at the same time. It may be true that Herman Mankiewicz wrote most of "Citizen Kane," scene by scene and even shot by shot. What is certainly true is that nothing else that survives of Mankiewicz's is remotely as good as "Citizen Kane." That's because he was writing "Citizen Kane" for Orson Welles. Johnny Hodges spent many years on his own, with every chance to keep his tunes to himself. No other standard ever emerged. Suppose Billy Strayhorn had been liberated instead of "adopted" and infantilized. Would he have had the energy and mastery to form a band, sustain it, recruit the right musicians, survive their eccentricities and addictions, give them music they could play, record it, and keep enough of a popular audience alive to justify the expense of the rest? It is painful to read of Strayhorn desolate over having credit for his music stolen by the Duke; it is also the case that Ellington had the genius not to have to cry. Ellington's ear, his energy, his organizational abilities, the shortness of his decisions are a case study for management school. (Consider the way he fired Charles Mingus for fighting with Tizol, fondly but with no appeal: "I'm afraid, Charles—I've never fired anybody—you'll have to quit my band. I don't need any new problems. Juan's an old problem…. I must ask you to be kind enough to give me your notice.") These are not ordinary or secondary gifts. They were the essence of his genius. Ellington had an idea of a certain kind of jazz: tonal, atmospheric, blues-based but elegant. He took what he needed to realize the ideal he had invented. The tunes may have begun with his sidemen; the music was his. This is not a secondary form of originality, which needs a postmodern apologia, in which "curating" is another kind of "creating." It is the original kind of originality. There is a reason that Duke's players mostly complained of being cheated only of the dough. Originality comes in two kinds: originality of ideas, and originality of labor, and although it is the first kind that we get agitated about, we should honor the second kind still more. There is wit, made by the head and spun out into life; and work, created mostly by fingers engaging tools as various as tenor saxes and computer keyboards. It is an oddity of our civilization, and has been since the Renaissance, to honor wit more than work, to think that the new idea "contributed" by the work matters more than the work itself. What Johnny Hodges was doing in making those new melodies may have been more like copying errors in ceaseless cell fission then like premeditated decision: as he set to playing the same chord changes over and over, night after night, a lucky error in a note may, one night, have touched another and become an innovation. It was a happy accident produced by hard labor. But that it reflected effort as much as inspiration should only increase its value. No author really minds, too much, seeing his or her ideas "out there," to be recycled, and even a conceptual artist has a slightly guilty conscience trading in that commodity alone. (That's why Jasper Johns fans insist that it is the finish, the touch, that really matters.) What artists dislike is having their effort recirculated without we recompense. It is our sentences, not our sentiments, that we ought to protect. The Duke's men grasped this. They were glad to concede to their self-made duke all of his preëminence—indeed, his royalty. They just wanted him to hand over their royalties first. What mattered was the band. Duke Ellington was a great impresario and bandleader who created the most stylish sound, and brand, and American music, and kept the company of musicians going for half a century. That this description seem somehow less exalting than calling him a "major American composer" or a "radical music innovator" is a sign of how far we have to go in allowing art to tell us how to admire it, rather than trying to make it hold still in conventional poses in order to be admired.